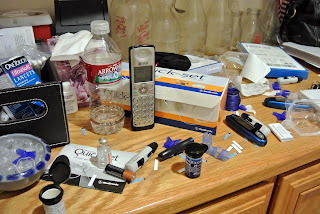 Today, on day 6 of D Blog Week, we are supposed to post some "snapshots" of Our Diabetic Life. but then I realized that these pictures don't really embrace what OUR Diabetic Life is all about. Our life is about love. Our life is about support. Our life is about family. Our life is about friendship, and being there for each other. So I'm posting this video of L that wraps up Our Diabetic Life in a nutshell. For those of you who receive my posts via email, the video won't show up in your inbox. You'll have to click the link to my blog HERE to see the post. Thank you! Love that video! Thanks for sharing. Great job, L! Great song L, that really is what the DOC is all about! Wow, and I thought I was the only one who still had those purple reservoir boxes! But I'm glad you closed the post with the video, because although it makes for good photos, diabetes isn't about the "stuff". It's about the people, the relationships, and the desire and motivation to do well for ourselves and each other. I love the "yeah, yeah, yeah" part! Way to go L!!! And, yes, the supply closet made me spit out some coffee this am. Love you Meri! I'm with Reyna LOVED the yeah, yeah, yeah part!! and of course always love to her your voice :) Great job L..Your a ROCK STAR! !